Boil the greens in salted water for 5 – 10 minutes. Drop the broccoli rabe in first, and the chard after a couple of minutes. I like my broccoli rabe soft and melty, but take it out when it looks good to you. Drain the greens in a colander and run a little cool water on them. Chop them roughly. In a large frying pan warm some olive oil. Add the garlic, red pepper flakes, and lime zest. When the garlic starts to brown, add the greens. Stir and cook till they’re warm through, and just as wilted as you like them. Put them in a bowl and stir in the butter and the honey. Squeeze the lime juice over everything. Season with salt and pepper. Sprinkle basil over the top. Serve!! 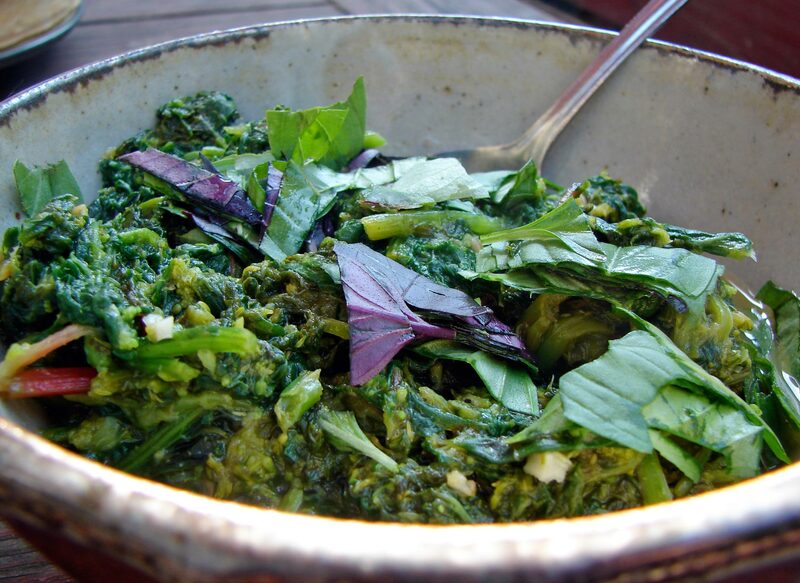 This entry was posted in recipe, Uncategorized, vegetable side dish and tagged broccoli rabe, chard, fresh basil, greens, honey, lime, red pepper flakes, washing greens by Claire. Bookmark the permalink. Yes, this is exactly how I wash greens! The big basin of water method wins every time–especially because the dirt sinks and the leaves don’t. Those spicy greens sound perfect as well!